The answer to most problems in the workshop is to develop a jig that avoids you having to do things more than once and to unify some aspects of the construction. An alignment box jig is a perfect solution for drilling accurate holes in mating components without having to mark out twice. 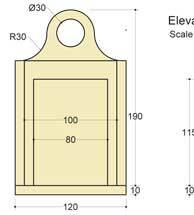 The only critical factor is that it is square at one corner, the dimensions are up to you. I used biscuits to make my box but screws would be quite acceptable. When you're satisfied with the box select the best corner and plant a small fence along two edges. Ignore the outside edge of the box and concentrate on making sure the inside face of the two fences are square with the corner edge of the box and therefore in line. 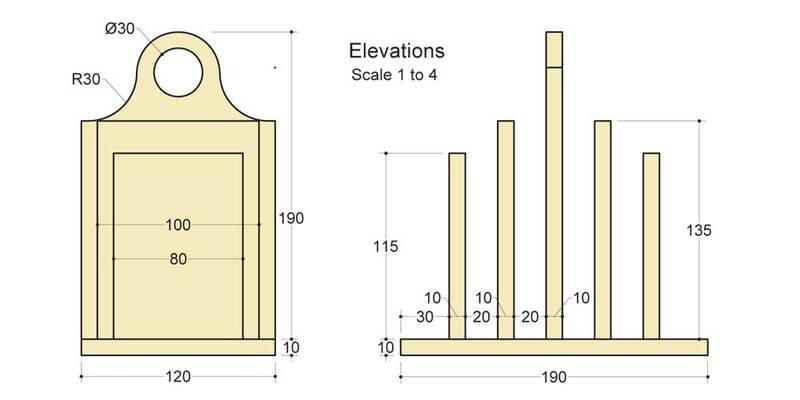 I like to work 'off centres' whenever I can whether it be in the workshop or on site as this seems to be the most reliable and convenient datum for any number of measurements. Every component has a centre in two axes and once established it can be used to simplify cutting, drilling and location. On the underneath of the rack begin by marking centres for the uprights - dividers - in this case 30mm apart. Extend the lines down both edges and number each line. Take one of the dividers and with a marking gauge place a line clearly off centre on the bottom edge then replicate this line from the other face. It should now be simple to find the centre of the piece by eye by positioning the gauge point in the middle of the two marks. 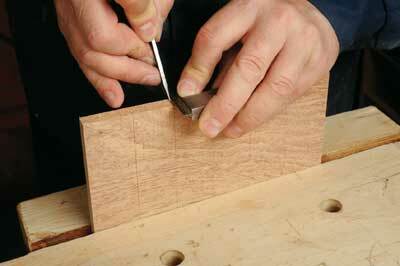 Just tap the rod of the gauge on the bench to make tiny adjustments without having to use a ruler. Extend the mark a short way along both sides. At this point you will notice that we are still working with the dividers at the same width as the base board. Without a pillar drill screwing into end grain can prove tricky but fortunately we have our alignment box jig to get round this. 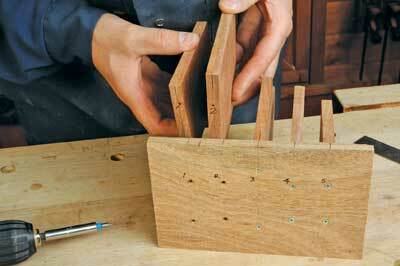 Begin by taking the first divider and clamp it to one side of the jig, tight up to the fence and flush with the top. 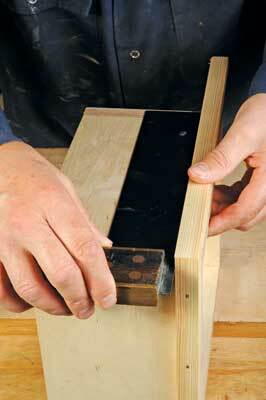 Now place the base board face down on top of the jig, line the marks up on the edge and clamp in place. 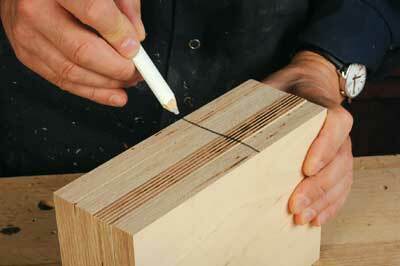 Drill through the centreline into the divider with a 2mm bit. 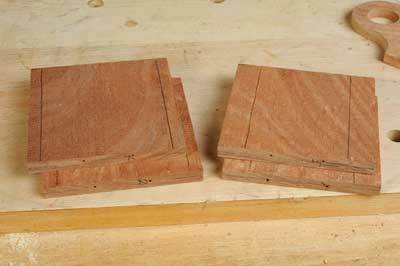 To avoid having to mark out an exact position for the holes just be sure to have the numbers all facing the same way as they are clamped to the jig. Repeat for all the dividers keeping away from the edges. 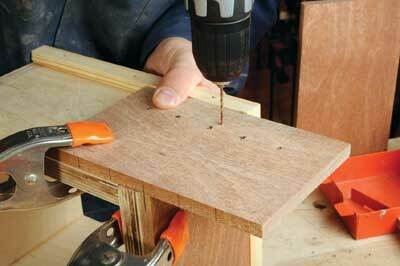 Re-drill the holes in the base to the gauge of the screws, 3mm in this case and countersink. 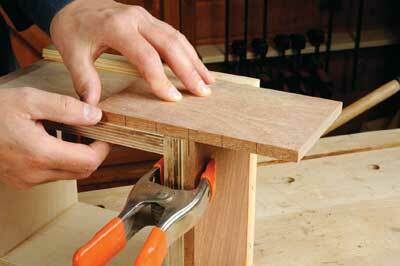 A simple way to set out for the shape on top of the middle divider is to divide the width by four. 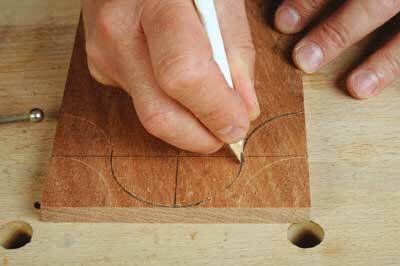 Take a pair of compasses set to 30mm and mark down from the middle of the top edge to establish a centre for the semicircle. Mark a line across the board and draw the top curve extending just below the line. 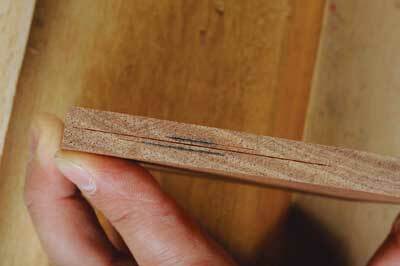 Slightly reduce the setting on the compasses by about 1mm and complete the shape either side of the semicircle. You may need to feather the lines to join them up neatly. 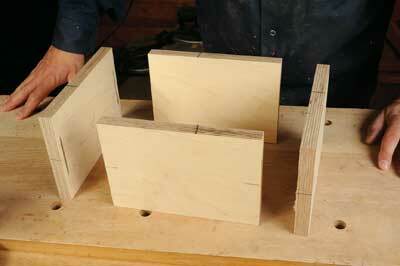 The shape can be cut using either a bandsaw or jigsaw. Make a series of straight cuts into the curves stopping just short of the finished line to let the waste fall away easily and prevent the blade from overheating. A bobbin sander will make light work of smoothing out the curves but a sheet of abrasive paper wrapped around a thick piece of dowel will work just as well. 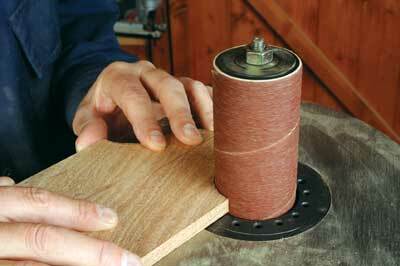 To finish off drill a 30mm diameter hole in the centre of the top curve. 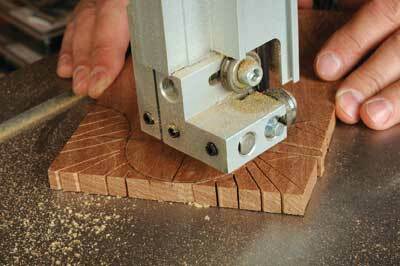 With all the holes drilled you can now resize the uprights by cutting the same amount of material from each side. 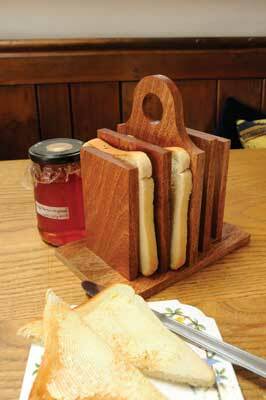 Now's the time to do any rounding of corners, and sand and finish with a food safe oil like tung oil. When putting together, make sure the numbers on the uprights correspond with those on the base in sequence and in orientation.